Fake news. It is a juvenile epithet, but it has power because it is both thoughtless and memorable. It is also a debate stopper. When uttered with a contemptuous smirk, it’s the equivalent of “shut up!” No intelligent response can suffice, no evidence-based retort can win. “Fake news” has the charm of comedy, the ease of a sound bite and now the imprimatur of the president of the United States of America. 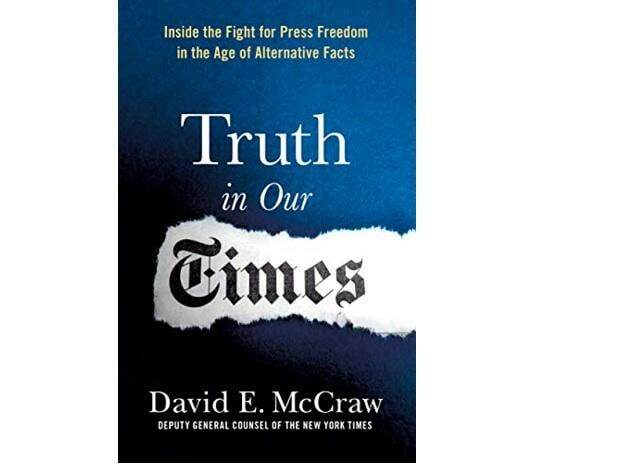 In his fine new book, Truth in Our Times: Inside the Fight for Press Freedom in the Age of Alternative Facts, the New York Times deputy general counsel David E McCraw thoughtfully (and entertainingly) addresses this state of affairs as he takes us behind the scenes of the venerable (or failing, depending on your perspective) New York Times. A self-professed “raving moderate,” McCraw is in prime position to provide this backstage view as he draws equally on his experience as a writer and a lawyer. He excels at both, explaining legal issues in lay terms and unspooling the stories that propel the book. McCraw is rightly proud of his role in defending The Times in so many controversies. But there is also a whiff of helplessness in his telling about the degradation of truth and of people’s trust in the press, neither of which is really a matter of law or legal policy. The law, it turns out, is in good shape. Legal freedom, as an attorney might say, is necessary but not sufficient. Just as important, McCraw explains, is public trust: “It doesn’t really matter how much freedom the press has in a society if the press is not believed. A distrusted press is little different from a shackled press.” This is the crisis, well identified. One need not literally shutter press outlets in the manner of Recep Tayyip Erdogan or Xi Jinping or Vladimir Putin to render the press irrelevant and impotent. But occasional and understandable bouts of pessimism aside, Truth in Our Times is not dire. It is spirited and hopeful and even, at times, lighthearted. It is, in a way, a love letter to the First Amendment. McCraw captures the mood best in one early sentence: “It was a hell of a time to be a lawyer for The New York Times.” It sure was.